If you don't have a garden, or no inclination to work in your garden, but you love trees, then Bonsai trees are well worth considering. Personally, I adore things in miniature and Bonsai trees are one of my favorite "little" things. These diminutive trees come in all shapes and sizes, the more popular being the Olive and Hackberry and Fig trees, to the stately and majestic mini Oak tree. Bonsai trees don't grow on their own and need maintenance, some more than others. This Ortho's All About book will guide you along your way. You can emulate almost any outdoor setting inside, just in miniature. And, of course, there are some Bonsai trees that can live outdoors if the climate is cooperative. I'm getting myself a Dwarf Gardenia which flowers in May to July and it is just so cute. You even get a Crabapple tree, a Dwarf Pomegranate, and a gorgeous flowering Quince. See the quaint Japanese Gray-bark Elm on page 120. I do like the Japanese Maple and the Bouganvillea and the Japanese Flowering Cherry trees. You can nip and tuck and train your tree to suit your aesthetic needs and choose from an ever-increasing variety. 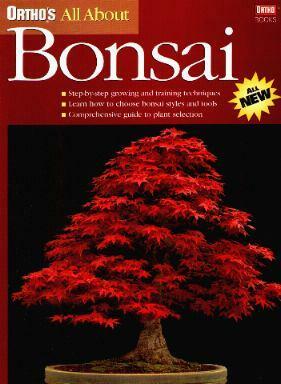 Caring for Bonsai trees is very therapeutic and calming and has long been a Japanese tradition. This book offers helpful advice such as watering, fertilizing, pruning, repotting, pests and disease, light, and styles. Now that I know more about these little cuties, I'm off to get myself set up. Conclusion - Extremely interesting and well-laid out.